The Surefire Fury is one of the smallest Surefire lights but but it packs a lot of illumination in a very compact package! 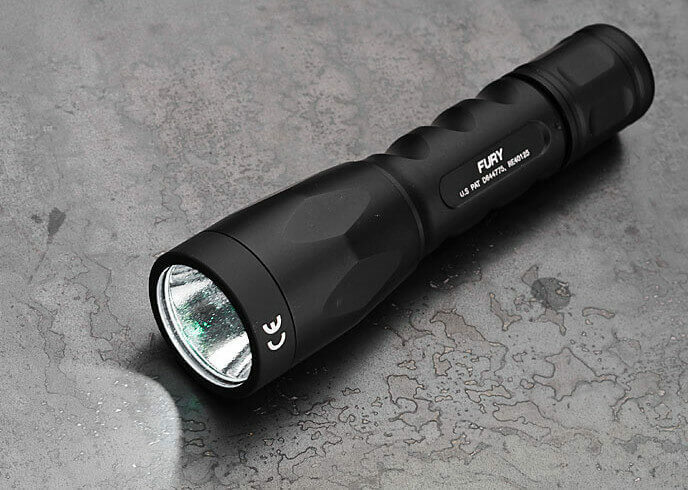 At 5.4 inches (13.7 cm) and a loaded weight of 5.7 oz (161.6 g), the Fury is an ideal light for EDC and outperforms flashlights many times its size. As a tactical light, it has two output settings. On ‘high’, it puts out a massive 600 lumens and easily lights up a large area. Its ‘low’ setting of 15 lumens is bright enough for tasks like map reading but yet does not destroy your night vision. The Surefire Fury also has a deep reflector, giving it a good bit of “throw” (how far the light can reach) for its compact size. It runs on two CR123A batteries, which is quite impressive considering its max output. Want: A very powerful 600 lumens flashlight in a pocketable package!